Deteriorating weather in Perth, Australia, early Friday is making the search for possible pieces of the missing Malaysia Airlines plane in the southern Indian Ocean more complicated. Getting more planes up in the air out over the site at the daylight became more difficult. Still, Australian officials said Friday that one search plane had arrived back in the search area, two others were en route and a fourth was scheduled head there a bit later. One merchant vessel was also there, they said, and a second was en route. With winter approaching, the south Indian Ocean is rough and the skies cloudy, both added challenges for the Australian pilots. A freighter used searchlights early Friday to scan rough seas in one of the remotest places on Earth after satellite images detected the debris. Sarah Bajc, whose boyfriend, American Philip Wood, was aboard the plane, is one of those anxiously awaiting news. "I'm desperate to hear it is an airplane wing and there are survivors clinging to it, and one of them is Philip," she told CBS News by email. "I'm apprehensive it will be unrelated and the wait will just continue after many more hours of misery." "I am prepared for dead bodies," she wrote, "but I am not prepared for never knowing." One of the objects on the satellite image was almost 80 feet long and the other was 15 feet. There could be other objects in the area, a four-hour flight from southwestern Australia, said John Young, manager of the Australian Maritime Safety Authority's emergency response division. A satellite image taken on March 16, 2014 and released by the Australian Maritime Safety Authority shows debris believed to be possible wreckage from Malaysia Airlines Flight 370 in the Indian Ocean, about 1,500 miles west of Perth. Four military planes searched the area Thursday without success. A U.S. Navy P-8 Poseidon aircraft was scheduled to join the search, but like the other planes, it will have enough fuel for only a few hours before returning to Perth. "It is a very long journey to the site and unfortunately, aircraft can only have one or two hours over the search area before they need to return to the mainland for fuel," Warren Truss, who is currently Australia's acting prime minister while Tony Abbott is overseas, told Australian Broadcasting Corp. He said that weather conditions in the area were poor and may get worse. "And so clearly this is a very, very difficult and challenging search. Weather conditions are not particularly good and risk that they may deteriorate," Truss said. The objects spotted on the satellite images were at the extreme southern end of the projected southern search corridor, so in an area where all earlier information suggested crews might expect to find the missing jet. The largest object could be one of the Boeing 777's wings. As the flight would have been near the end of its fuel supply in reaching the area, the fuel tanks in the wings would be close to empty, giving the wings added buoyancy. "CBS This Morning" contributor Michio Kaku, a physics professor at the City University of New York, said the area is "quite turbulent, and even a gentle current of five miles an hour could carry debris of hundreds of miles across." The search is a "literal race against time," according to Kaku. "The black box has a beacon, but that beacon has a battery -- a battery with a life 30 days," he explained. "And we've already lost two weeks, so of the window of opportunity is closing very rapidly." 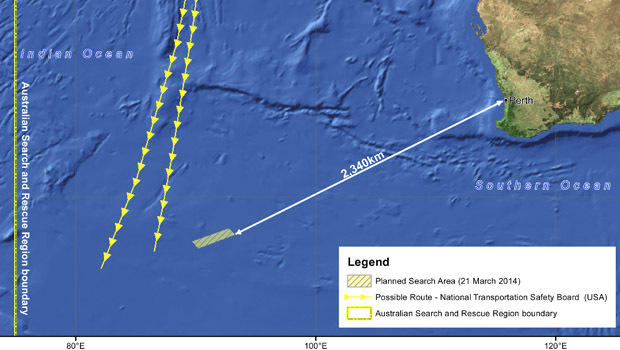 A map provided by the Australian Maritime Safety Authority on March 20, 2014, shows the area being searched after satellite images showed possible debris from Malaysia Airlines Flight 370. "It would be very nice if you could see a whole wing floating there, then you could say, 'OK that's an airplane.' When you're looking at something like this you can't tell what it is," said Sean O'Connor, an imagery analyst with IHS Janes. Hamid Amran, who had a child on Flight 370, said questions asked at the meeting made it "apparent that Malaysia's military is incapable of protecting its own airspace." CBS News confirmed the FBI has been provided electronic data to analyze from a flight simulator belonging to the pilot of the missing jet. It is expected the hard drive will be brought to an FBI lab in the United States. This FBI is lending technical expertise, not taking over the investigation. It was not clear whether investigators thought that deleting the files was unusual. They might hold hints of unusual flight paths that could help explain where the missing plane went, or the files could have been deleted simply to clear memory for other material. "We have put every resource that we have available at the disposal of the search process," Obama said in an interview with Dallas-Fort Worth television station KDFW. He said the nation's thoughts and prayers were with the grieving families. Three Americans were aboard the flight.